I’m kind of on a papaya kick, if you haven’t noticed. Last week I shared my take on a Vegan Papaya Salad (seriously, so good). Last summer I shared my Tropical Papaya Boats (hello fruity dessert heaven). And this week, a papaya smoothie! For not being my #1 favorite fruit, I must admit, papaya is growing on me. I even tried a pomelo this week. Who am I? 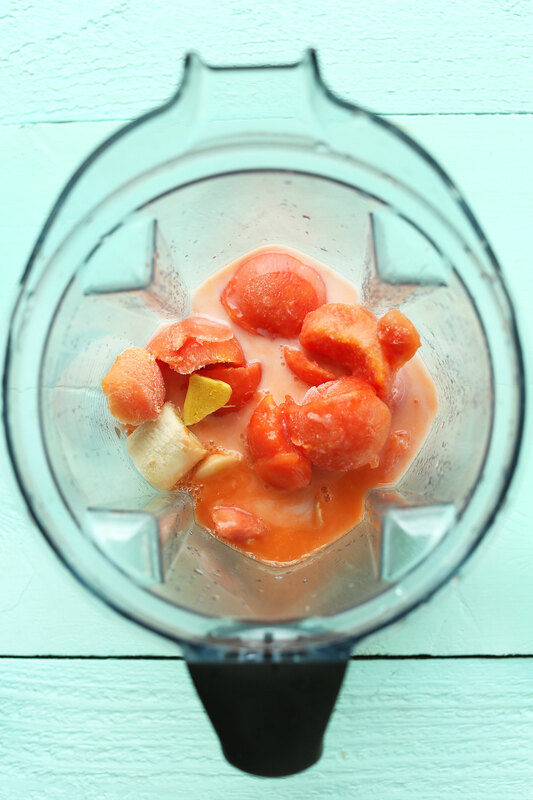 This smoothie was inspired by a surplus of papaya after experimenting with my papaya salad. I had some leftover fruit and decided to freeze it, which lends itself perfectly to smoothies. 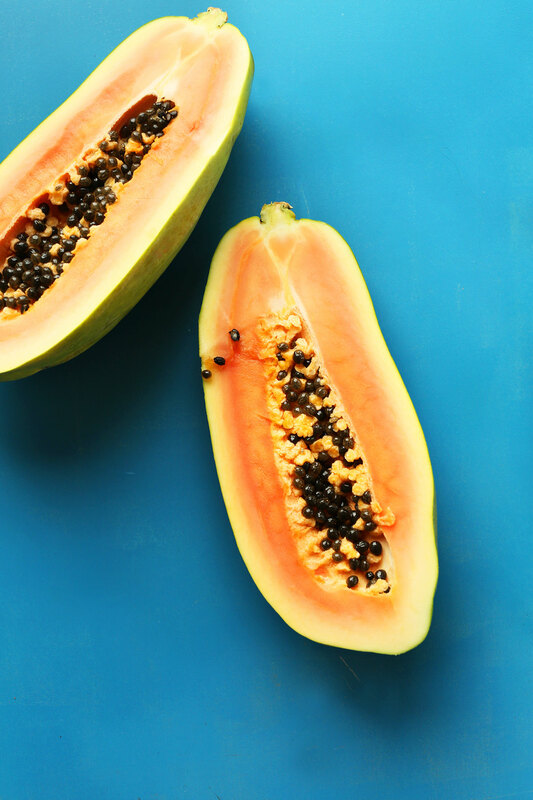 Plus, papaya is incredibly nutritious and detoxifying with tons of vitamin C, antioxidants, digestive enzymes, and folate, among other health benefits. As always, this recipe is simple, requiring just 6 ingredients, 1 blender, and 5 minutes to prepare. Frozen papaya and banana make up the creamy, naturally sweet base, while ginger and lime add a balance of zing and acidity. 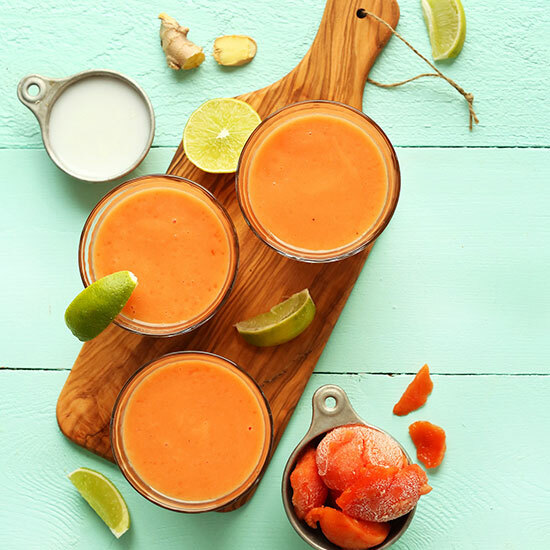 Carrot juice gives it a beautiful orange color and even more nutrients, while coconut milk adds healthy fats and creamy coconut flavor. Major swoon. If you give this recipe a try, be sure to let us know! Leave a comment it, rate it, and don’t forget to take a picture and tag it #minimalistbaker on Instagram. We love seeing what you come up with. Cheers, friends! 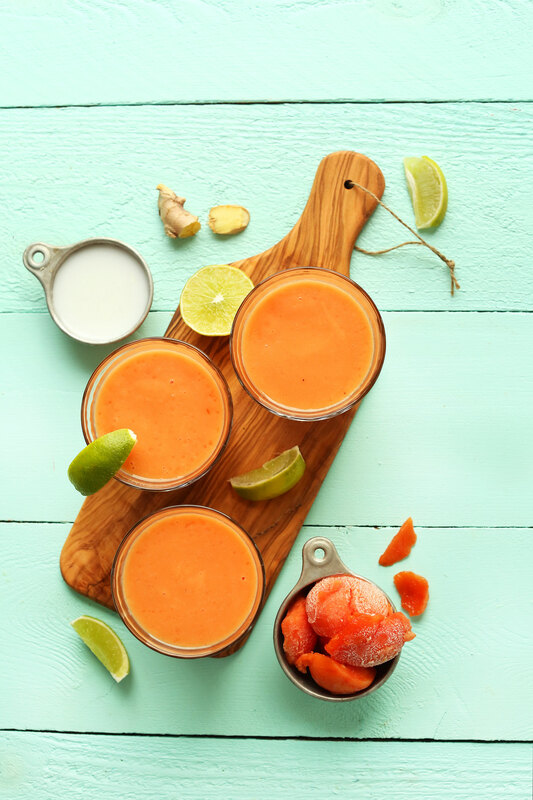 Creamy papaya smoothie infused with lime, ginger, carrot, and coconut milk! Just 6 ingredients in this nutrient-rich, naturally sweetened smoothie - perfect for breakfast or a snack. Add all ingredients to a blender and blend until creamy and smooth, adding more carrot juice or coconut milk if it has trouble blending. Taste and adjust seasonings as needed, adding more banana (or agave) for sweetness, lime for acidity, or ginger for zing. Enjoy immediately. Store leftovers covered in the fridge for 24 hours, or freeze into popsicles for longer term storage. *Prep time does not include freezing papaya or banana. I’m new to the Vitamix life so this might be a silly question but could I throw a chopped up carrot into the mix to sub for carrot juice since I don’t have any on hand? This smoothie looks like lunch today! Very interested to try but what can I substitute for banana since I have that allergy? Thanks!! Frozen mango, avocado, or even cauliflower! We are so glad you enjoyed it, Bhavna! I LOVED this smoothie! For those of you looking for papaya, try a Latin/Hispanic grocery store. Plus veggies and fruits are usually less expensive there as well. Idk if it’s the same in other states, but here in Texas they are. Papaya tends to go bad quickly if you don’t eat it rapidly. The “Fiesta” store where I bought mine sold the papaya cut in half for like $2. I used 1/3 of that for the smoothie. For the carrots, ginger and lime: I juiced two medium sized carrots and that made 1/2 cup. I juiced about an inch of ginger and 1 lime instead of two. For the rest of the ingredients: I used my almond coconut milk and 3 teaspoons of honey. Tossed in half a banana and went a little extra and added about 6 frozen strawberries. Great smoothie! I may have only had coconut cream on hand instead… whoops but ended up very smooth with a nice bite thanks to the ginger! Think I’ll turn the rest into desert “creamsicles” for dessert! Also, made it with lemon instead of lime and turned out delish! In Dominican Republic, papaya (lechosa) smoothie is very common and so delicious. We typically just do papaya, milk, ice, and sugar. Some people add nutmeg or cinnamon, but it really doesn’t need it. I am interested in making a vegan option perhaps with full coconut milk to lend to the rich creamy texture, but I fear the flavor will not be the same. Suggestions? It’s sooo yummy! I made it with coconut cream and lemon as that’s all I had on hand xD happy blending! A perfect blend of complex flavors! Creamy, tart – yet sweet & exotic. I love fresh papaya fruit with lime squeezed over it — but the addition of coconut & ginger take the experience to a whole new level. The carrot juice imparts an awesome color. Very balanced. Great job! I used a tablespoon of raw honey & it was just right as my papaya was not overly sweet. Super yummy! There was a bunch of leftover papaya at a pool party earlier this week so I took it home and froze it, not knowing what to do with it. 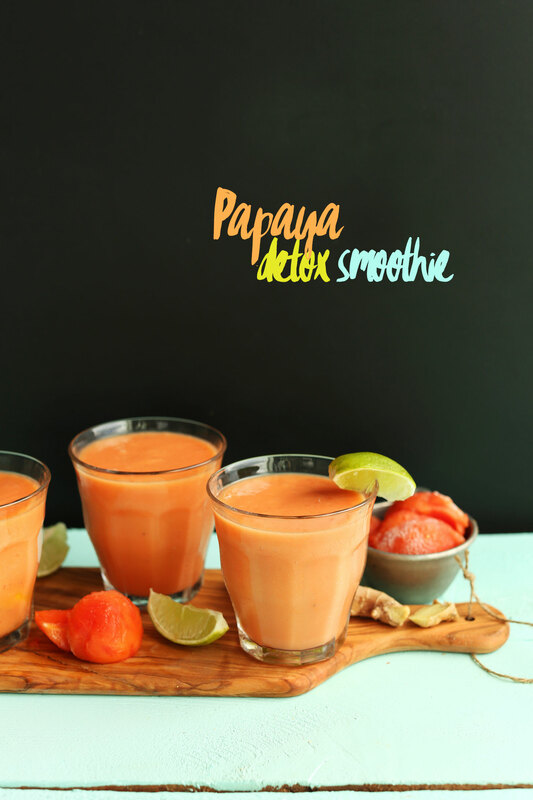 I looked up papaya on your website, found this recipe, and made smoothies this morning. SO GOOD! I didn’t add any sweetener and I thought it was plenty sweet on its own, so for out there who don’t have huge sweet toothes, I would say stay away from any additional sweetener. Yay! Thanks for sharing, Rae! Looks delicious, Thank you for all of your wonderful recipes. Can I sub the coconut milk for young coconut water? I am going to recommend this to my sister, she has been wanting to make a smoothie and this looks amazing. Thanks. Made this as written and it was sooo good! Thank you for sharing! Just made this smoothie. Wow! So delicious. Thank you for all of your wonderful recipes. Can’t wait for your book which we pre-ordered. Dana, if I am allergic to bananas, what can I substitute them with to get the same consistency? I wanted to ask this question, too! Not sure if just adding more papaya will mess up the balance of the flavors? This was so delicious, thank you! Wow! I am really impressed with this recipe. I’m not a papaya fan at all, but I wanted to give it a fair try as a smoothie ingredient. Blended with the other ingredients, it was wonderful! I will definitely make these again. I enjoy your recipes a lot! I am working on “top 5 smoothies” article on my site where I collect smoothie recipes from several sites. I do not share the recipe, but I share that it is a great recipe and link back to the original site. I would love to add this smoothie to the list. For that, I would love to use one of your pictures, clearly stating that the picture is yours, with a link back to the original article. Would that be okay? Looks so delicious! I’ve been drinking lots of fresh pressed juice and juice smoothies lately after indulging in holiday goodies. Great way to clean and detox. This sounds (and looks!) spectacular! I love that you added carrot juice. Never would have thought of that! This sounds so refreshing, delicious, and light! Love the coconut!! I’m a fan of smoothies so I’ll have to make this one soon!!! Thanks Dana!! Such a beautiful colour! Especially against that minty teal background :) I tried papaya once and wasn’t too into it but this smoothie looks like it’s full of flavour so I’m going to give papaya another try! I have to admit, I’ve never had papaya. I know! Shock, horror! But this smoothie looks so refreshing and colourful that I just may have to walk myself over to the store and grab one. I love the addition of lime, ginger, and coconut too! Sounds delicious! Great recipe. Need to try this!! The bright orange of the smoothie is giving me some longing pains for summer. Oh this sounds like heaven! I don’t eat enough papaya. That needs to change! This smoothie looks delicious. Unfortunately I rarely see papaya in our grocery store :(. If I ever do, I will snag it and make this smoothie! I never even think to look for papaya in our grocery store!!! That’s gonna change internet friends. Gonna look now. I’m the smoothie man in our house, wife cooks, but I make the smoothies. Too $$$$ to buy out. Anyhow, I didn’t know papaya had that much Vitamin C. WE are stocking on on VC these days to ward off flu and colds!